Things are still pretty quiet around the preserve, but the fun thing about nature is that it is always changing so you never know what you are going to discover on a given day. Yesterday turned out to be a day of curiosities. The picture below is the first mystery. The mystery. What kind of bird was it and what happened? A closer look at the feathers and zooming in to the large feather in the picture below revealed part of the mystery. The feathers are those of a mourning dove. This dove was probably “recycled” by a hawk or owl, I have seen this scenario before and once actually witnessed a copper’s hawk devour a cardinal, leaving a scatter pile of feathers. Later in the day, as Nora and I were checking the route for a future hike. we came across the usual tree below. The clue to what caused this curiosity can be seen just above the spiral section. It is a small light colored piece of an old vine ( probably honeysuckle), While the vine was alive and growing, it constricted the normal growth of the tree as the vine wound its way up the tree to get sunlight. The vine has since died leaving behind the twisted looking tree. Sometimes you just come across simple things like the snail shell below that was resting on a rich green carpet of moss. 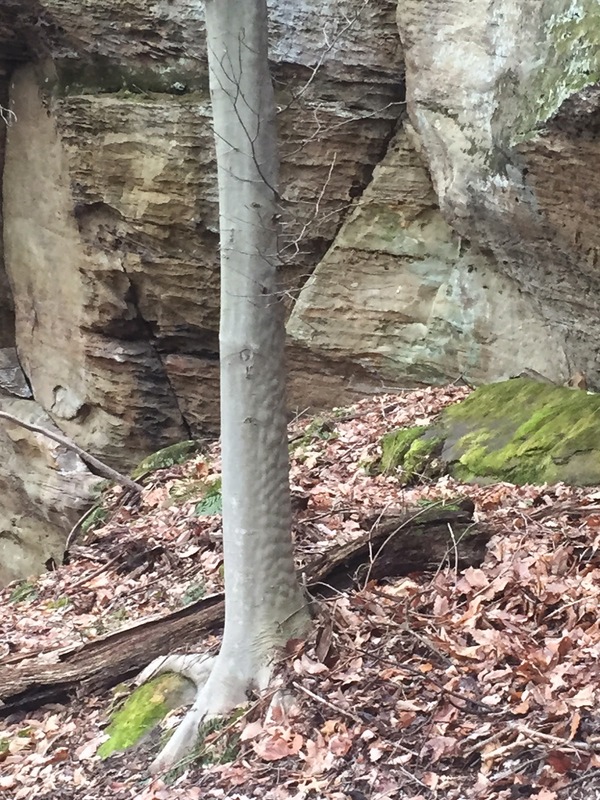 Up near the base of the sandstone cliffs we found the American beech pictured below. There was something odd about the bark. A close up examination revealed the picture below. 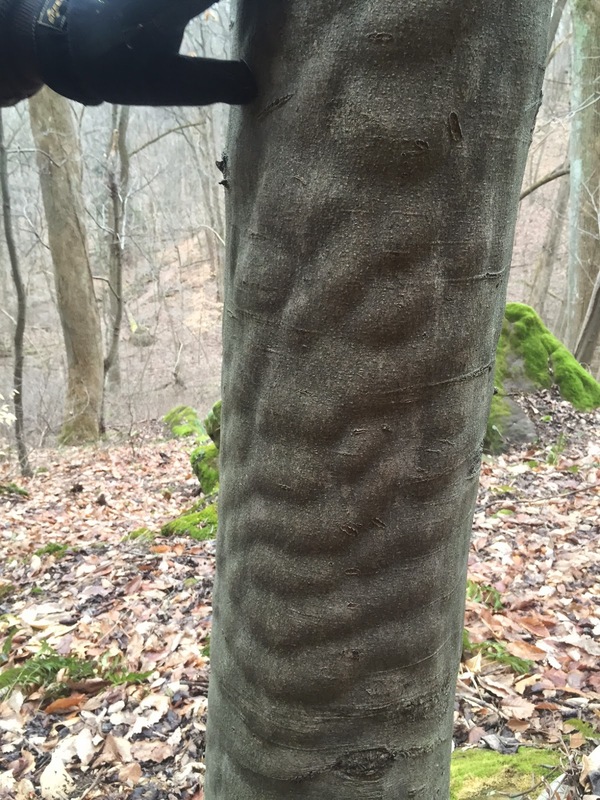 Only the side of the tree facing the cliff was abnormally rippled while the rest of the bark was smooth as one would expect see on beeches. While still somewhat of a mystery, this curiosity may be caused by some hormonal problem within the tree. And finally, below is a clump of walking fern, Asplenium rhizophyllum, growing off the side of a large moss-coverd sandstone boulder. Rhizophyllum roughly translates to mean “root leaves” and refers to its unusual habit of spreading. The tips of the frond will root themselves and another plant will grow. Walking fern is more commonly found growth on limestone and rarely on sandstone like is found at Wahkeena- so a good find. So as you can see, even during the January thaw, there are curiosities and mysteries to unravel in the winter woods. Not to be too much of a nitpicker, but you might want to correct the earlier post that mentioned “murtle” instead of “myrtle.” And this time you surely meant to write “mourning” dove, not “morning” dove. Do keep writing, though, because it's always great to read about what's going on at Wahkeena! Thanks Hamanda for catching the misspelling. I sometimes end up doing these post late in the day and don't have a second proof reader to correct words that spell check does not recognize as wrong in these particular instances.